I subscribe to a very popular blog written by an American. I'm always amused by the photographs, which oftentimes come from European gardens. The author is a great designer who takes inspiration from travels abroad. But where are all those European garden principles the blogger speaks of used around here? I rarely see them. Right now, of all the beautiful gardens I've seen in the United States, many have some elements of European design, but there's just something that sets even the simplest garden in England, France or Italy apart. (I admit, I've not been to southern California since I was 24 years old, and that was only at night; however, I've seen photographs from both there and the San Francisco area that reminded me of Europe). Furthermore, it's been almost a decade since I've traveled to scout locations for A Gardener's Diary on HGTV), but even back then, I saw very few places that really looked as if they could actually be in Europe. Not that there's anything wrong with that fact. We have wonderful gardens here that would stand up to anything you would see abroad. But there's something about gardens in England, France and Italy in particular that have a quality that appeals to me and is hard to duplicate here. I'm not really talking about wide flower borders with delphiniums and pleached linden trees, or expanses of lawn and hedges dotted with sculptures. There's something else I can't quite put my finger on. Admittedly, francophile that I am, there's no way I can achieve the gardens I deem suitable to go with my house (which is copied exactly from a photo of an abandoned house in Normandy). First, I don't have the right topography, much less climate. I have, however, copied the hedges and arbors and tunnels I admire in European gardens. But, once you get away from the immediate area around my house, you run straight into woods, steep slopes and lots of shade. Steep would work fine if there were no trees. Witness the miles and miles of rock wall terraces that cover the mountains of Greece, for instance. But thick woods (for which I am grateful) are not amenable to terracing. When I saw the scene above - a chef of a famous hotel cutting rosemary in a large (flat) potager - I felt a twinge of envy. The sunny space contained vegetables, herb gardens and an orchard. 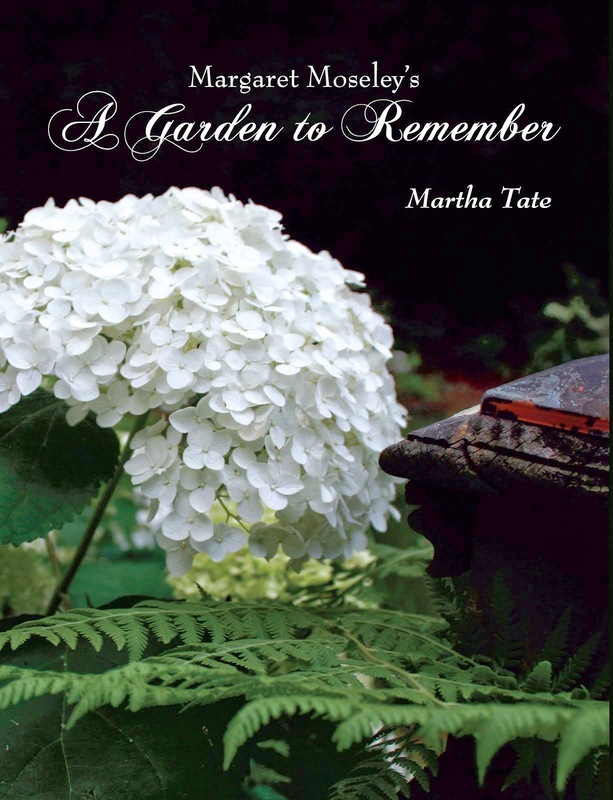 The arrangement suited my aesthetic longings exactly - straight lines with hedges; squares filled with herbs; tunnels and arbors, along with grape vines, espaliered and free-standing fruit trees. There were also several pomegranate bushes laden with heavy fruit. Roses climbed the tunnel supports, and dahlias and other fall flowers had their own big rectangle. It was dreamy. Ducks waddled about, and, I'm sure, much to the chagrin of the gardeners, a bunny rabbit nibbled away on something green (lettuce?). Having written all this, let me make one thing clear. 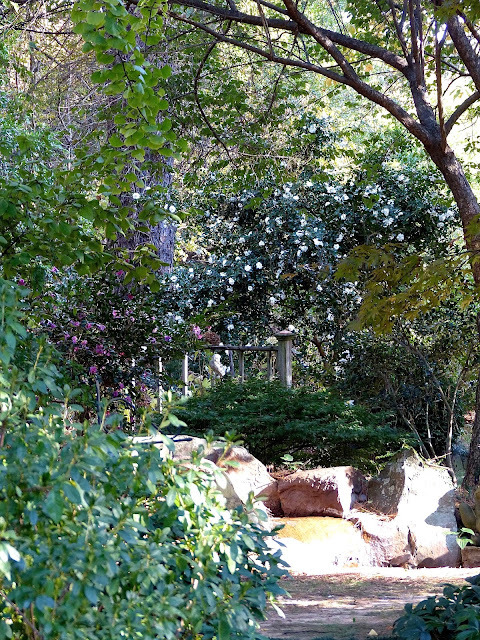 I can name several gardens right here in the Atlanta area that are as beautiful as I've seen anywhere. Many of them don't have a single element I'm talking about here. I love informal Southern gardens, in particular. But, something in my psyche makes me long for those flat, sunny spaces, organized with clipped hedges, long, straight vistas and defined areas brimming with flowers and fruit. All this seems poignant today when it is cold and rainy and windy, and the tall trees on the ridge above me seem menacing. I think this will all change when the sun comes out and changes my perspective on things. It's been a long, rainy spell, and that sets one to dreaming of other places - like this potager - which I saw on a much different type of day.